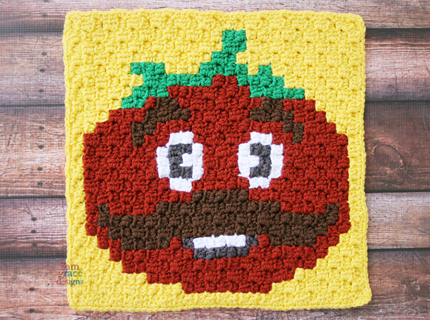 How To Crochet A Fortnite C2C Graphgan – Our Fortnite Tomatohead C2C Crochet pattern contains our Week 9 graph for the graphgan crochet blanket based on the popular Fortnite game. 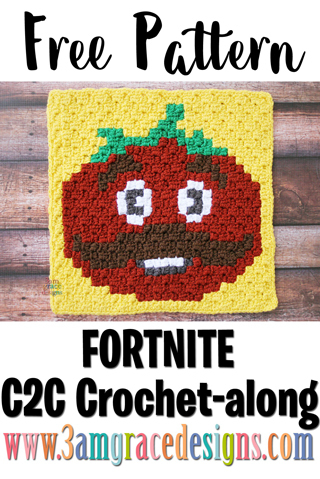 We’re excited for Week 9 of our Fortnite free C2C CAL crochet pattern! We’ve worked hard to design a project you will love! This panel is one piece to our Fortnite C2C crochet pattern & tutorial for creating a game inspired graphgan blanket. This week we have Tomatohead. Our panel is made using Hobby Lobby ‘I Love This Yarn’ in Jellybean, Brown, Yellow, Graphite, Terra Cotta, and White. Download the Tomatohead written instructions.